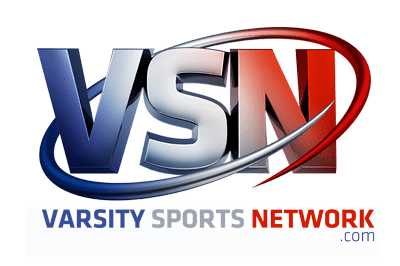 Fifth-ranked Mount de Sales, the top seed in the IAAM B Conference basketball playoffs got a tougher than expected challenge from 8th-seeded St. Timothy’s, Wednesday in Catonsville, but the Sailors hung tough for a 42-33 victory and a place in Friday’s semifinal round. The win was the 22nd of the year for Mount de Sales and the 200th career victory for head coach Trish Armstrong. Co-captains Kristen Zaranski (16 points) and Abby Kuhn (13 rebounds) once again led the Sailors. Friday’s semifinal will feature Mount de Sales hosting 5th-seeded Glenelg Country School at 5:30 p.m. The winner of that game will play in the IAAM B Conference Championship Game on Sunday at 4:00 PM at Stevenson University. Glenelg Country advanced to the semifinals with a 46-31 upset of fourth-seeded Annapolis Area Christian. The other semifinal will feature 2nd-seeded Mount Carmel against 3rd-seeded St. Paul’s School for Girls. Mount Carmel got a major scare from 7th-seeded Maryvale Prep before prevailing, 49-47, and St. Paul’s routed 6th-seeded St. Mary’s, 75-46. 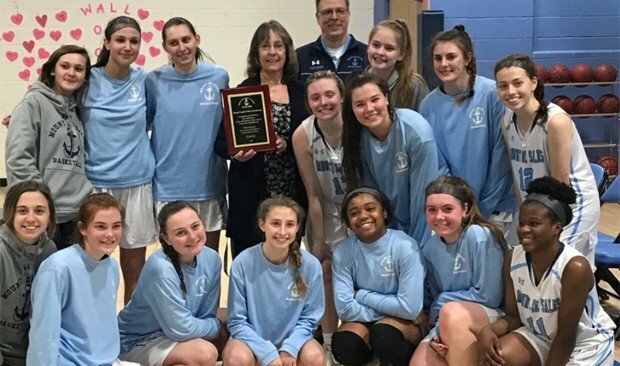 Pictured above: Mount de Sales players for a team photo with head coach Trish Armstrong (center) and plaque commemorating her 200th career victory.